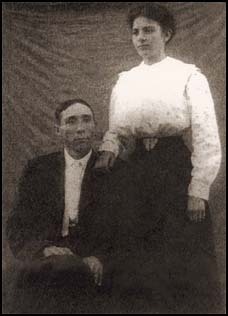 Milton Burns BATEMAN and Mary Elizabeth Simmons BATEMAN. Mary Elizabeth Simmons, b. 20 May 1891, was a daughter of Murdock Middleton SIMMONS and Louisa Clarinda THIGPEN. She and Milton resided in Franklinton, Washington Parish, Louisiana, and are buried at the Ellis Cemetery there. This was a scan of a xerox image. I added a little sepia and dulled the grain. The drapery in the background leads me to believe the photo was not made in a studio but instead perhaps at a fair or by a traveling photographer. We have a very similar photo of Mary’s brother, Lucius, and his family, showing a drapery background in a natural setting and Lucius’ wife Annie dressed in the same style as Mary. That photo would have been made about 1911 and may help date this photo. Milton Bateman’s middle name was Burns not Burton. I am his granddaughter.